Professional cruise journalist Anne Kalosh sailed aboard the Emerald Princess during one of the ship's first voyages in April 2007. 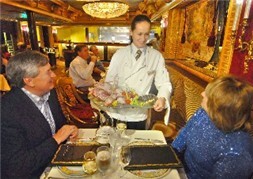 In this feature article, Anne focuses on the ship's dining options -- from the tried-and-true Sabatanis to the line's new "Chef's Table" offering. So come along as Anne details what you too may find if you sail on this ship. 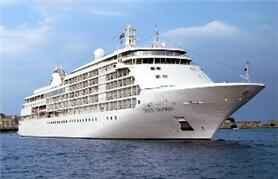 Culinary training has become extremely popular at sea, so it's no surprise that ultra-luxury Silversea Cruises has jumped into the cooking school concept. 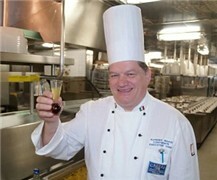 In fall 2007, the line began a new Viking Cooking School onboard its ships. The school was developed through the company's existing partnership with Viking Range Corporation. On voyages designated for the cooking school, guests enjoy cooking demonstrations in a custom-designed set up within the ship's theater. Holland America Line is continuing its commemorative wine series. 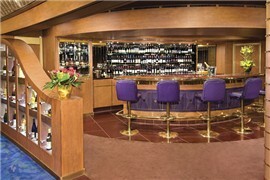 Two new specially crafted wines by Wente Vineyards are the newest additions -- available onboard Holland America ships. One is a Cabernet Savignon, the other a Chardonnay. In addition, the commemorative wine also is part of the “Sommelier Package,” a new onboard offering that also includes a standard wine tasting, a premium wine tasting, dinner at the Pinnacle Grill, wine navigator’s choice of five bottles, and a wine-related gift set.